This week I had another discussion with a sales executive where he went off on saying how his sales team was terrible and the reason the company was going to miss its 2016 numbers. Specifically, he was saying how the team spends too little time prospecting and too much time taking care of existing business. Does this sound familiar? I see it happening far too often in companies of all sizes. We as leaders of our companies must take the lead when it comes to prospecting. Our salespeople take their cues from what they see us doing. When we spend nearly all of our time dealing with existing customers, it sends a signal to Sales they should be doing the same. If we want our sales teams to be prospecting more, then they have to see us doing it. We can’t just beat them up over it. Sorry, that technique died years ago. If all you want to do is beat them up, then you’ll spend your time doing nothing but replacing your continuous turnover. 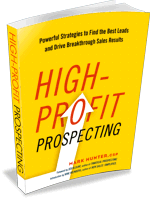 Let your sales team see you prospecting. Make it a point to share with them the conversations you’re having with people, including the new customers you’re meeting with and what you’re learning. When prospecting is part of your regular routine, it will become part of their regular routine.